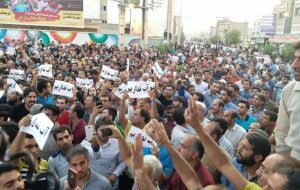 Iran Protests in Borazjan, over the water shortage and the mismanagement of the water supply be the regime. Borazjan, in Iran’s southern province of Bushehr, is known as the land of palm trees and sunshine. The warm dry climate provides the perfect conditions for growing dates with a rich, full flavor. But under the tyrannical rule of the clerical regime, the same climate that yielded the city’s high-quality dates is exacerbating a water shortage caused by the mullahs’ mismanagement of natural resources. The city’s residents took to the streets on July 3rd to protest the water scarcity and dire economic circumstances faced by the local population. On July 7th, the demonstration was still in full swing. 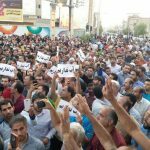 The brave residents gathered in the city’s Hospital Square, chanting slogans such as “death to the dictator” and “we don’t want an incompetent government”. On Friday, July 6th, the protestors disrupted the regime’s Friday prayer ceremony and continued well into the night. By Saturday, July 7th, the protest had entered its fourth consecutive day and is showing no signs of abating. Shahin Pakrooh, a deputy of the regime’s state-run water and wastewater engineering company, estimated that 334 of Iran’s cities are facing water shortages. Of those 334, 107 of them are reaching a critical level. The Iran Meteorological Organisation estimates that around 97% of the country is experiencing drought, with the Energy Ministry calling the current drought the harshest in more than 50 years. The People’s Mujahedin Organisation of Iran (MEK) called the water crisis one of Iran’s six “super-challenges” Iran faces. Although the year has been one of the driest on record, the situation has been vastly exacerbated by the regime’s water mismanagement. The regime has systematically manipulated the natural flow of Iran’s water sources for its own financial gain. Excessive dam construction has caused lakes, rivers, and wetlands to dry up. The mullahs’ water mismanagement has destroyed the livelihoods of those living in rural communities. A 2017 UN report warned that agricultural livelihoods are “no longer sufficient”. Many Iranians are being forced out of their homes in pursuit of economic security, abandoning their communities, and heading to the cities without shelter, work, or money. The residents of Borazjan are the latest to protest the situation. Last week, demonstrations were also held in Khorramshahr and Khuzestan, and in April 2018, the farmers of Isfahan staged protests at the water shortage which ravaged their crops and destroyed their livelihoods. Pakrooh added that the situation in some cities could worsen before it gets better. Isfahan, Kerman, Fars, Khorasan, and Sistan-Baluchestan provinces will face a more severe shortage before the end of summer, according to Tasnim, the state-run IRGC news station. Instead of offering meaningful solutions to the water crisis devastating Iran, the regime has provided nothing but violence and empty promises. In Borazjan, the regime’s promises aimed at quelling the protests were greeted by choruses of, “it’s a lie! It’s a lie!”. In Isfahan, the response was more aggressive. According to the MEK, the regime raided protestor’s homes in the middle of the night, arresting large numbers of protestors in an attempt to prevent the protests from spreading. Borazjan’s brave residents are speaking for the whole population of Iran. Their chants of “we don’t want an incompetent government” resonate with Iranians from all over the country who are tired of struggling to water their crops and provide drinking water for their families.